So said Russian President Vladimir Putin, upon re-emerging from a mysterious ten-day disappearance, during which the internet exploded with speculation he was dead. The Kremlin added fuel to the fire after posting photos of Putin on its website it claimed were current – but which turned out to have been images from a meeting that had taken place a week earlier. Why are Russians so willing to swallow misinformation? Have the country’s citizens – after decades of learning to read between the lines during the Soviet era – suddenly become gullible? Not exactly. Instead, the Kremlin has become increasingly sophisticated in its media strategy. Even as it continues to enforce conformity of coverage at home, it criticizes conformity abroad. Moreover, it borrows from the playbook of its former Cold War enemy, the US, to shape public opinion – in part by concocting a powerful story of Western spin. To the international audience, the Kremlin advertises pro-Russian coverage as an “alternative point of view” that any truly “free” press should acknowledge. “Question More” reads the slogan of the Kremlin’s English-language news service Russia Today (RT). Likewise, in selling their product as more open-minded alternative to the supposed “Anglo-Saxon mass-media monopoly,” RT has enjoyed astonishing success. These media agencies are slick – and not stupid. In particular, their criticism of the American political establishment is often hard-hitting, conveying concerns about US-led hegemony shared by other countries across the world. Such outlets typically argue that the US media frames the Ukraine conflict in outdated Cold War clichés, and that it too readily embraces Ukrainian leaders who are also manipulating information to elicit Western sympathy (not to mention vast amounts of financial aid). It also argues that Western media hypocritically avoids probing into the United States’ own checkered record of overseas crimes. Some accuse the Kremlin of “weaponizing information,” combining the Newspeak of George Orwell with “the savvy of Don Draper.” According to journalists Peter Pomerantsev and Michael Weiss, Russian “political technologists” work behind the scenes to insert deliberately false material into international public debate in the name of balanced and objective coverage. At the same time, they strive to discredit the very principle of objectivity, encouraging viewers to believe that – especially during international conflicts – all journalism is skewed by politics and preconceptions. It’s a deeply cynical strategy. But it works. Most Russians appear to embrace the argument that “everybody lies” – including the West. Kondrashov and others point out that US corporations and Hollywood celebrities (not to mention US presidential candidates) all hire expensive PR firms to place stories, tactically leak information and cultivate point people who can be relied upon for appropriate spin. And, indeed, a recent report from the Bureau of Labor Statistics predicts a decrease of 7,200 journalism jobs by 2022, but an increase of 27,400 positions in PR. Then there’s the mass hiring of internet trolls to articulate a pro-Putin message on Western media sites. Many US journalists have called it a “Kremlin attack” to “claim control over the internet.” Moderators at the British Guardian – where articles can be flooded with as many as 40,000 comments a day – have termed it an “orchestrated campaign.” Meanwhile, the English-language Moscow Times has been forced to shut down its online discussion forum, citing floods of spam. Russia’s only remaining independent investigative newspaper interviewed individuals who admitted to being paid to produce a quota of 100 posts a day. But in explaining their responsibilities, the interviewees echoed the language of US election campaign managers who organize “rapid response” teams of volunteers to write letters to the editor, post on social media and comment on articles – all to shape and influence debate. Russian celebrities also play a role in molding public opinion. His next project will be a television series about the death of legendary 19th century Russian writer-diplomat Aleksandr Griboedov. The director claims that he will correct the historical record, to “prove” that Griboedov was killed in Tehran by Muslims acting under the direction of British spies during a time of Anglo-Russian competition for influence in Central Asia. Though set in the distant past, the project reinforces contemporary media messages: just as the British connived to undermine Russian interests in 19th-century Persia, so, too, are the Americans meddling in Ukraine. But US popular culture is also filled with anti-Russian allusions. 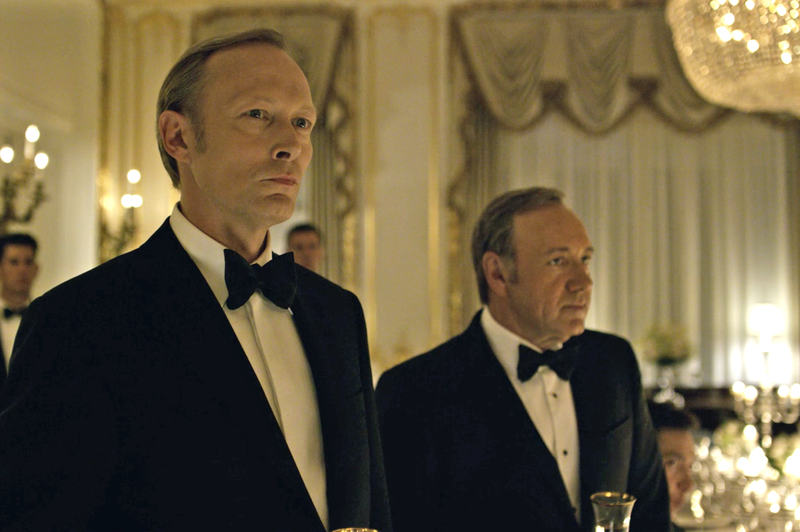 For example, the third season of House of Cards depicts US President Frank Underwood locking horns with his Russian counterpart, Viktor Petrov – a figure who shares not only the same initials as his real-life model, but also a KGB background, an extended term in office, a failed marriage and a penchant for political cynicism. “Russia has nothing to gain from peace in the Middle East and, more importantly, nothing to gain from working with America,” Petrov intones in one episode, minutes after being received at the White House. Viewers are thereby encouraged to link contemporary Russian intelligence operatives to the Soviet-era KGB, with a twist of modern-day ISIS thrown in. But differences in degrees of media freedom matter, and borrowed strategies do not mean equivalent ones. What’s important is to find a way to criticize the shortcomings of US media practice and policy, without fully embracing Russian spin. Meanwhile, the most popular programs remain the ones where fact and fiction unapologetically blur. A self-described “documentary film” that aired in mid-March to commemorate the first anniversary of Russia’s annexation of the Crimea opens with a shot of a Russian Orthodox church, a military helicopter and an interview with Putin. Crimea: The Way Home first aired in mid-March and has already garnered over 5 million views. Combining professional History Channel-style packaging with staged re-enactments of events (that may not have even taken place), the film, titled Crimea: The Way Home has already garnered more than five million views online. It’s a testament to the immense – and rapid – growth of Russia’s mighty media megaphone. To read about how Russia is building a psychological firewall against the West, click here.